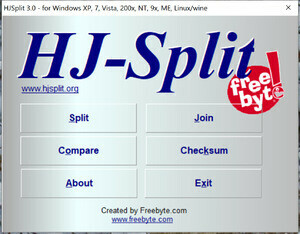 HJSplit is a superb freeware file splitting program which aides users wishing to share large files over the web, whether it be via email or posting something on a newsgroup or forum. The first function of the program is to split one file into multiple files, the second part recombines the multiple parts into one large, original and usable file. The application overall has a very simple and straight-forward interface making getting around quite easy and quick. Without including the bulk which most programs in the category seem to do, HJSplit gets right down to it and enables you to get your task done without messing around. For security reasons, you should also check out the HJSplit download at LO4D.com which includes virus and malware tests. Additional screenshots of this application download may be available, too. HJSplit has a presence on social networks.